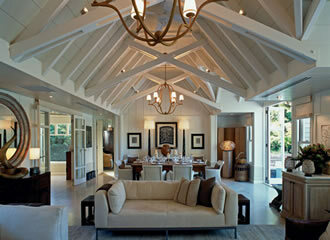 The Owner's cottage is almost completely hidden away on the grounds of Huka Lodge. 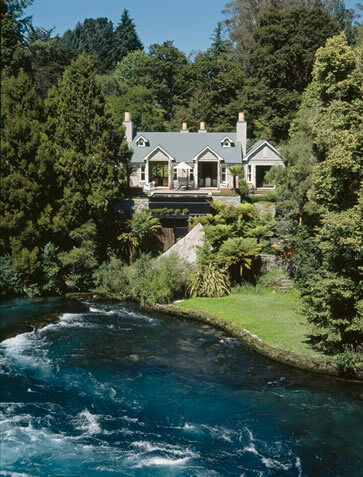 Its location is ideal, right on the Waikato River and offers magnificent views downstream and all the way to the beautiful Huka Falls. This gorgeous wooden cottage was originally built in 1937 and has four spacious guests suites. There is also a large living room, dining room, kitchen and den. The interior decor uses cream hues for the walls, and bleached Oak wooden parquet floors adding to the relaxed ambience of the cottage. The guests suites have super king size beds and their own ensuites and fireplace. 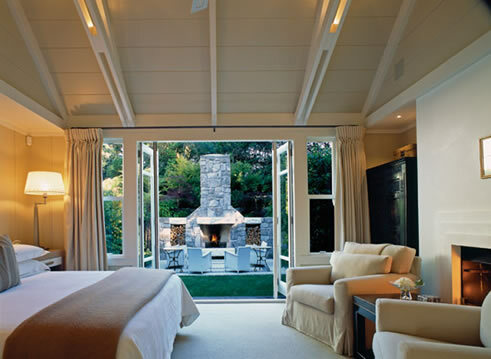 Two of the guest suites face the river, while the other two face a private garden courtyard. The living room is located in the centre of the cottage with a beautiful stone fire place, high ceilings, cream suede couches and antique leather chairs. There is also a well equipped kitchen so a Huka Lodge chef can be arranged or you may cook for your self - whichever you please! The Den has a workstation featuring desk with computer and printer. Other diversions include plasma – screen television and a DVD player, extremely comfortable leather chairs and a cozy fireplace complete the picture. The Owners Cottage also has its own pool and heated spa pool, with plenty of relaxing and sun bathing areas.